"Choose this", he advises beating with a large metal key against stone for further effect. The stone block responds with a clear sound. "This is what the Stari Most was made of", says the craftsman I asked for a tombstone. In Bosnia and in the Balkans there are many bridges – old and new, beautiful, ancient, important, famous, great – but when you say 'Stari Most' (Old Bridge), there is only one bridge you can be talking about: the medieval bridge of Mostar. Built nearly five centuries ago, the Stari Most was destroyed during the war in Bosnia and Herzegovina in 1993. The Croatian units bombed it for two days until, on November 9th at quarter past ten in the morning, the bridge collapsed into the river. The destruction of the Old Bridge was the pinnacle of the dramatic war that led the Croats against their up-to-last friends, neighbours, and allies: the Bosnian Muslims. A year before the war began in Bosnia and Herzegovina, the Yugoslav People's Army (JNA) had moved several units to Mostar. I had seen them in March 1991. There had even been sporadic killings, but people – shocked and outraged – whispered of drunken reservists crossing the Old Bridge on Jeeps. They shook their heads in disbelief, as if to say that such behaviour on the part of people who did not respect the sacred things (for people the bridge was, and still is, a divine institution) did not promise anything good. Indeed, in 1992, the JNA put Mostar under siege, bombarding it regularly and mercilessly. Even then, the bombings ordered by Serbian general Momčilo Perišić had damaged the old bridge. In the first year of the war, Bosnians and Croats fought together against the common Serbian enemy. But in 1993, when the international community's "peace plans" rewarded occupation instead of punishing the (Serbian) aggression, the Croats were quick to take "their share" of Bosnia and Herzegovina (as tells Luca Rastello in his wonderful book, "The war at home"). Croats gave the old bridge the fatal blow. Those responsible for the destruction, six Bosnian Croats in the highest political and military ranks of the so-called Croatian Community of Herceg-Bosna (the entity proclaimed in 1991 and dissolved in 1994), were deemed by the Hague Tribunal responsible for a "joint criminal enterprise" and sentenced from ten to twenty-five years in prison. Among them, Croatian general Slobodan Praljak was deemed the main responsible for the destruction of the Stari Most and sentenced to twenty years. He was the one who declared that "those stones" (the bridge) had no value. The destruction of the Old Bridge was not a random act, nor the action of a few undisciplined soldiers. On the contrary, it was the result of a strategy planned by Croat and Bosnian Croat political leaders to remove the Muslim population. In the verdict against the six Croats, the Hague Tribunal argues that "the destruction of the Stari Most is a violation of the laws or customs of war […] a conscious act on the part of the authors, who aimed to destroy the enemy's cultural identity through material destruction and the degradation of the population". In 2004, the Old Bridge was rebuilt exactly as it was, with the local stone tenelija extracted in the Mukoša quarry, with which the bridge had been built five centuries ago. 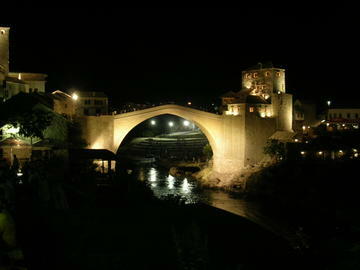 For its beauty and uniqueness, the Stari Most was recognised as world heritage and placed under the protection of UNESCO. In ancient times, building a bridge was considered as a work of great benefit, not only because it facilitated the daily lives of people, but also for its function to unite what is divided, far, different. Thus, the Pope is also called Pontifex – builder of bridges. The Old One (as mostarci, the people of Mostar, used to call it with tenderness), had joined the east and west banks of the Neretva River for almost five centuries. It united people, religions, ethnic groups, and different worlds. Over time, it had become the main symbol of the city, the point of reference for its citizens. It was part of their cultural identity, an expression of Bosnian culture. Apart from this its metaphysical meaning, the old bridge is a jewel of medieval Ottoman architecture – as such, its symbolic value exceeds the feelings of the local people. Its delicate arch, the elegant crescent that divides the deep blue of the Neretva River below from the blue sky above, places it among the twenty most beautiful bridges in the world, according to a recent ranking. It is hard to watch it without admiring the genius of the author, who managed to build a human work in perfect harmony with the landscape. The bridge seems natural, as if grown spontaneously rather than built. It seems that the architect wanted to defy nature, joining the banks where the river is still wild and untamed. The Mostar Bridge was built in 1557 by architect Mimar Hajrudin, a disciple of Sinan, the father of classic Ottoman architecture. It was made with 456 blocks of white stone, held together by a system of anchors and dowels. Two fortified towers protect it: the Helebija tower at north-east and the Tara tower at south-west. Upon its completion, it was the largest single-arch bridge in the world. Some technical matters related to its construction remain a mystery: how the scaffolding was erected, how the stone was transported from one bank to another, how the scaffolding could remain standing throughout the long construction period. As a result, this bridge can be classed among the greatest architectural works of its time. The footage of the destruction, filmed by Bosnian Zaim Kajtaz, quickly spread around the world. The barbaric act provoked outrage and unanimous condemnation – it has been compared to the Nazi destruction of Warsaw, or the demolition of the Cathedral of Cologne. We were convinced that the Stari Most was built to last forever. This is why the news of its destruction seemed impossible. At first, no one believed it. The tragic event marked us so much that most of us remember exactly where they were and what they were doing when they heard the news. When the news spread, the people of Mostar – besieged for a year by the Serbs and exposed to Croatian bombings – reacted instinctively. "People who were hiding in cellars, incredulous and disregarding the danger, came out from shelters and went running to the bank, looking for the bridge. Hundreds of men, women, children stared stunned the vacuum and the abyss. The Old One was gone. Shouting, crying, threatening, cursing, they raised their hands to the sky and wondered: why? ", wrote in his diary Džemal Humo, a poet from Mostar. Jasminko S. recalled that as a boy, in exile, he entered the house and found his mother in tears. He thought his father had been killed, but his mother tucked between sobs: "Something worse, they demolished the Old One". "I heard the news while I was in the trenches, on the front line. I felt as if someone had hit me in the stomach with a baseball bat", said Goran O. "I cried because I realized that I had lost not just the old one, but also my city, and forever". Željko, a Croat, held prisoner by the army of Bosnia and Herzegovina, has tragic memories: "I was a prisoner of the Army of BiH. I did not know the bridge had collapsed, I loved the Old One, it was mine too. Some members of the Army of Bosnia and Herzegovina, furious, beat me and broke my leg". It was revenge for what Croats had done to the Old One. On November 9th, 1993, I was visiting painter Emir Dragulj in Zemun, a suburb of Belgrade. He opened the door in tears. I thought something had happened to his brother in besieged Sarajevo, but the painter told me the radio had just confirmed the news that the Old One had been destroyed. On November 10th, 1993, the day after the destruction of the Old Bridge, former Croatian President Franjo Tudjman met his closest collaborators. According to the transcripts, Tudjman said, "Just between us... in military terms, who benefits most from destruction?". "We do", said Mate Boban, minister and President of the Republic of Herceg-Bosna. 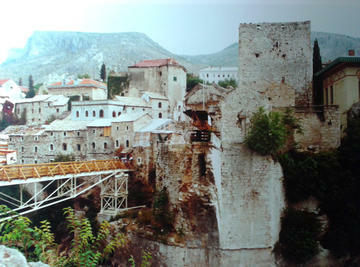 Eleven years after the war, the Stari Most was rebuilt. It shines today as the original did in the previous five centuries. At night, the lights (a gift by the Italian Government as a contribution to the reconstruction) make it spectacular. The Mostar bridge is the most visited attraction of Herzegovina, after Medjugorje. Each year, according to the tradition that started in 1968, daring, well-trained young people perform jumping from the bridge, from a height of 27 meters. Apart from these outstanding symbols, however, the politics of destruction and division have triumphed in Mostar. The pre-war population of the city, after the horrors of war, escaped, mainly to Scandinavian countries as well as to Croatia and Serbia. The city now has about 120,000 inhabitants, mostly Croats arrived from other parts of BiH. Mostar today is made up of two cities, all municipal services are doubled – two central post offices, two central stations, two educational systems, two universities, two water suppliers, two municipal cleaning enterprises, two fire-fighter bodies. On the right bank of the Neretva River is the "Croatian Mostar", well maintained, with few signs of war. According to a survey, eighty percent of young Croats in Mostar have never seen nor crossed the old bridge. For them, with the demolition of the bridge, "the last Turk disappeared from the Balkans", as wrote the Croatian press at the time. On the left bank, the majority is made up of Bosniaks. During the war, that part was almost razed to the ground. Three Italian journalists (Ota, D'Angelo, Luchetta) were killed in 1994 by a Croatian shell bomb, while they were doing a report on the children of Mostar. Mostar Croats and Bosniaks do not live together or next to each other but, as noted by a local journalist against each other. If they meet, they pass without a look or a word. The years have shown that the destruction of the Old One was not due to negligence or an involuntary accident. It was a premeditated act, a strong message from barbaric criminals who aimed at the complete division of ethnic groups, of two sides, of two worlds. The Stari Most has now lost its main function. It no longer joins, it has become the opposite metaphor. Beautiful and bright as it is, the Old Bridge enlightens us on where hatred and inhumanity lead.